Hanjan, it turns out, isn’t even being billed as a restaurant, exactly, at least not in the classic sense of the word. It’s Kim’s updated, big-city homage to the old travelers’ taverns of Korea, called joomaks, which in style and atmosphere resemble the gastropubs of England and the old-fashioned izakayas of rural Japan. As at Danji, the bare-bones, deceptively simple small-plates menu here is divided into columns, labeled “Traditional,” “Modern,” and “Skewers.” But the food has a heavier, more rustic, more classically Korean feel to it than Kim’s cooking uptown, and many of the dishes—the barbecue skewers threaded with chicken hearts or sizzling strips of gizzard, sticky ddukbokki (rice cakes) tossed in pork fat, vats of viscous, spicy cod-roe stew—are designed to be consumed at the bar, in a spicy lather, with copious amounts of sake, soju, and bottles of cold beer. The first dish my tasters and I sampled was a classic scallion-and-squid pajeon pancake, which in lightness and texture was about as different from your sodden, run-of-the-mill pajeon as a fresh-baked apple pie is from a frozen Sara Lee version. We had the pleasingly chewy ddukbokki after that, followed by a serving of bokkeum bap (Korean fried rice) mixed with a bracing radish kimchee and crispy chunks of chopped brisket. My friend the Octopus Loon thought the nuggets of the cephalopod in the similarly spiced octopus stir-fry had an unpleasant, knobby texture, but no one at the table had any complaints about the buttery (as opposed to oily) grilled mackerel, which the kitchen plates with wedges of lemon and cooling shreds of daikon. Kim won a Michelin star at Danji (he’s trained with Daniel Boulud, among others), and he has a knack for elevating these home-style recipes with classic technique. The delicately deboned Hanjan-style pork trotter wouldn’t be out of place in a top French bistro, provided you remove the little bowl of fermented shrimp dipping sauce it comes with. The house chicken is “fresh killed,” according to the menu, and broken down into the aforementioned skewers (a total of five varieties), excellent wings marinated in sake and soy, and spicy-sweet morsels of tong dak-style fried chicken. Only two perfunctory desserts are offered at this New Age joomak (sweet, glutinous rice ice cream and a sorbet duo), so save your money for another round of drinks, in particular the pale, frothy rice beer called Makgeolli, which is as smooth as coconut water and almost as sweet. Maysville, which opened several months ago just down the block from Hanjan, is another stealthily good new restaurant built around the pleasures of a stiff drink. 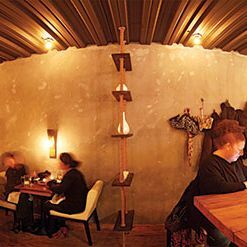 The boxy room, on West 26th Street, is larger and more impersonal than the snug little bourbon bar, Char No. 4, which the owner and brown-spirits connoisseur Sean Josephs opened on Smith Street four years ago. The lighting in this new Manhattan outlet is curiously flat, and when the big bar area is crowded with bewhiskered gents from, say, ­Teaneck, hoisting shots of Old Weller, the room can feel like a goofy Manhattan caricature of the Brooklyn original. But the diverse whiskey collection is easily one of the best in the city (there are more than 150 American whiskeys and roughly 80 more from as far afield as India), and if you’re a fan of new-school southern cooking, several of the dishes on the modest, elegantly restrained menu are worth a special trip. I’m thinking, in particular, of the roasted Brussels sprouts, which the former Gramercy Tavern chef Kyle Knall feathers with buttermilk dressing and a fine chopping of fried pigs’ ears, and the grits, which are served in a large bowl, like ramen noodles, and mixed with a smoky broth made from gently cooked duck bones, mushrooms, and a wobbly poached egg. Many of the heavier, potentially lumpen dishes at this neo bourbon bar are elegantly arranged on the plate (the crispy fried chicken leg, the duck, the rib eye served atop collard greens and puréed potatoes and smothered in a tangy vinegar gravy), and the lighter ones (the pink smoked trout, the arctic char dressed with tiny orange mussels) are light enough so that you’ll still have room for your dessert. The best of these is a refreshing granita flavored with green apples, and the brioche bread pudding, which is touched with a wisp of bourbon for a subtle, down-home kick. Hours: Dinner Monday through Saturday 6 p.m. to midnight. Prices: Small plates, $6 to $22. Ideal Meal: Scallion-and-squid pancake, grilled mackerel or fried chicken, pork trotter, Makgeolli rice beer. Note: The excellent, spicy, Korean-style house ramen is only served after 10 p.m.
Scratchpad: One star for the faithfully traditional cooking and another for the impeccable technique. Hours: Dinner Sunday through Thursday 5:30 to 11 p.m., Friday and Saturday to midnight. Lunch Monday through Friday 11:30 a.m. to 3 p.m. Brunch Saturday and Sunday 11 a.m. to 3 p.m.
Prices: Appetizers, $12 to $19; entrées, $24 to $31. Ideal Meal: Roasted Brussels sprouts, grits with egg, rib eye or smoked trout, bread pudding. Note: The weekend brunch features one of the better mint juleps in town. Scratchpad: One star for the polished nouveau-southern cooking and another for the voluminous whiskey collection.